We’d love your help. 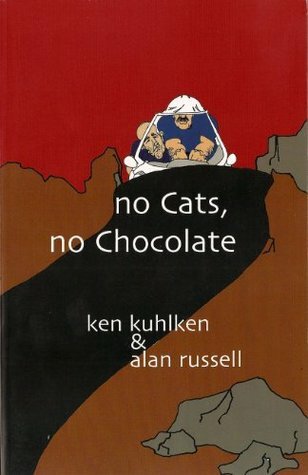 Let us know what’s wrong with this preview of No Cats, No Chocolate by Ken Kuhlken. To ask other readers questions about No Cats, No Chocolate, please sign up. "Amusing." That one word pretty much says it all. NO CATS, NO CHOCOLATE is less like a book, and more like two writer buddies horsing around on paper. Most of the book is comprised of them giving each other crap, so the degree to which you find the book funny will doubtlessly be influenced by how familiar you are with them and their careers. None of it is to be taken seriously, but it certainly made my recent subway ride more enjoyable. In this book there is everything you need for an entertaining story: there are colorful characters and some hysterically funny situations. It is about two friends but most of all about two writers and it is full of phrases, idioms, repartee, and eccentricities typical of writers. Timing is good but the word choice sometimes is a bit too gross. I’m a writer and despite this not being my favorite genre I found myself giggling and tittering at the absurdities of some scenes. In particular I loved the “ In this book there is everything you need for an entertaining story: there are colorful characters and some hysterically funny situations. In particular I loved the “I am not a romance writer.” situation because is the triumph of pure silliness but is somewhat believable. There is comedy and farce, but there are also human emotions,in particular the conflict between the desire to have a good reputation and the willingness to do whatever it takes to succeed (including writing a romance novel). religious fiction, adventure, and every other kind of novel being written. Not all the jokes are brilliant but there is always a nice touch of humor. If you are a writer you will enjoy it. I have read Alan Russell books before and liked them. This one is like a writing exercise. In this book where half the chapters were written by Kuhlken and half written by Russell, their voices are so much alike, I had difficulty keeping them separate. I read this ebook to give a review! I got it for free to do so. Well, I actually admire anyone that has the imagination to write a book and loved the title! That where it ends for me. I tried my best but never could come to like this story. I know not all books are for everyone. I struggled to get past the first chapter. I finally finished it and if I had not agreed to do this review honestly I wouldn't have.